Nanaimo-Info-blog: Politics With Passion ? This Getty News photo published in the Toronto Star shows how seriously some countries take their participation in government. 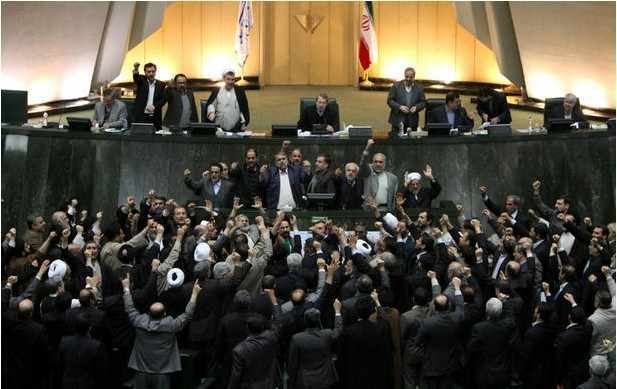 The clearly agitated crowd in the foreground are members of parliament shouting slogans calling for the execution of opposition leaders accused of stirring up unrest after a rally in Tehran. The riots were a show of support for the popular uprisings in Egypt and Tunisia. You will notice how their political leaders are actually safely seated atop, what can best be descibed as a sloped wall, making it most difficult for those who disagree with them, to actually get to them, before they can beat a retreat through the doors behind them. And we thought out Question Period was rowdy!